I was nervous about The Rite months ago when I saw the trailer. I feel like the exorcism genre has really brought anything new and fresh to the table in some time. 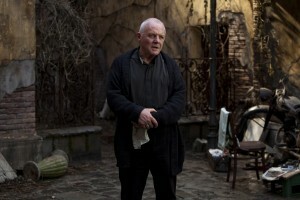 And I felt that Anthony Hopkins was playing a character we have seen before which there is nothing wrong with because he does it well. But again, nothing new and fresh. Add the fact that the film was released in January, aka movie wasteland, and my expectations were low. But this can usually be a good thing cause it can result into me enjoying the film even more. The Rite falls into all of my above worries, and results in a film that is just tedious to get through. The story revolves around Michael Kovak, a young man who only joined the seminary to get away from his date. He tells his mentor that he is not going to go through with the vows of priesthood so he is sent to a exorcism class in Rome to renew his belief in the faith. Kovak is very skeptical so therefore sent to see Father Lucas, a unconventional priest who is an expert in exorcisms. Kovak remains skeptical, thinking there must be a scientific explanation for everything that happens around him. He soon realizes that it is not science, but the work of pure evil. My biggest problem with The Rite is that there is no real pay off. I stayed interested in the film, or at least tried to, all the way up until Kovak begins to work with Lucas. But the exorcisms and scenes involving things depicted to represent the devil are not scary or even creepy. Those last five words lead straight to my next complaint on the film. I felt like everything they did in the film has been done before. Coughing up nails. Frogs, animals, bugs covering a room. Young child speaking obscenely. Nothing was new. Remakes and reboots are popping up everywhere, but some of the at least have a creative death or something tweaked a little bit that makes them different. This film lacked that aspect entirely. I just can’t suggest spending around ten dollars to see this film. Unless you really love exorcisms, and I mean REALLY love them, I think you would be better off to rent The Last Exorcism which is a film I wasn’t even crazy about, but it was certianly better than this. Fortunately for horror fans, you won’t have to wait long to see what will be the first good horror film of the year. The Roommate hits theaters next week. I give The Rite a D.